HomeRetaining Wall MacWall system installed at D3 Motorway in Strazov – Brodno. 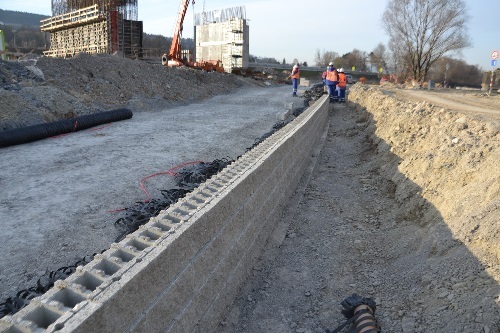 Retaining Wall MacWall system installed at D3 Motorway in Strazov – Brodno. The object 279-00 on motorway D3 Strazov – Brodno close to Zilina city is formed by a MacWall reinforced soil structure. The object 279-00 on motorway D3 Strážov – Brodno close to Zilina city is formed by reinforced soil structure MacWall, retaining wall with concrete MacWall fascia blocks with a maximum height 3,5m and a length of 157,50m. The size of the system of concrete blocks is 0,20 x 0,50 x 0,27m (H*L*T). Each block is made from concrete C35/45. The lower part of the wall is already built, and works in the middle section of the wall are still ongoing at the present. low cost in comparison with traditional concrete retaining walls. The maximum length of the geogrid reaches 6,0 m.
EUROVIA, the contractor, selected the MacWall system due to its main advantages: speed of construction, functionality and economic benefits in comparison with traditional gravity concrete walls.